Effects: relaxing, powerful antioxidant, stimulates mental activity and increases concentration, energises and refreshes, aphrodisiac, anti-cellulite, helps to smoothen stretch marks after pregnancy, antiseptic, disinfectant, deodorizes and freshens the indoor air. 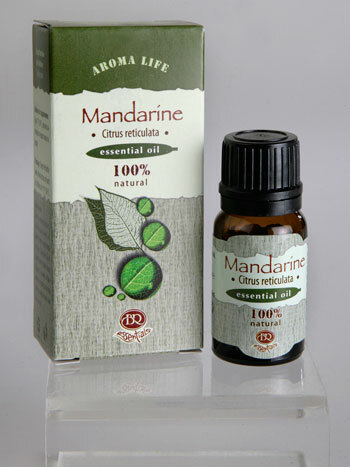 Benefits: The fresh and energizing scent of mandarin essential oil favors the stress reduction, alleviates anxiety and agitation. It improves the mood, providing vitality, joy and positivism. It provides good results against weakness and fatigue. The essential oil is especially favorable for women – it helps them to remove the stretch marks after pregnancy and to prevent unnecessary weight gain. Very efficient for face masks for aging skin. It is the safest essential oil. Blends well with other citrus essential oils, spice aromas, neroli, lavender, sandalwood, petigren, ylang-ylang, juniper, geranium and cypress. Attention: Contraindicated in hypertension and children. The combination of this essential oil with alcohol consumption is not desirable. Long-term use can cause euphoric states. The essential oil should not be applied on skin before exposure to sunlight!